DECEMBER 30, 2008  As hundreds of volunteer float decorators busily work toward their New Year's Day deadline, Gwen Smith finds a quiet corner of the warehouse for her task. There, she carefully arranges strands of buffalo grass, pampas grass and uva grass, pausing occasionally to ask passersby to critique her work. She doesn't mind that she'll spend the next several hours focused on an object that's barely a foot long. You see, Gwen has the privilege of decorating the body of Toto. 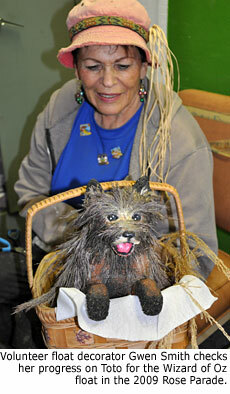 That's Toto, as in the dog Dorothy will carry on The Wizard of Oz float. Gwen wants the famous dog to be ready for his closeup. An estimated 40 million people in the United States will be watching this year's Tournament of Roses Parade, with millions more tuning in around the world. Gwen has been coming to Pasadena from her home in San Diego County for more than 15 years to take part in the decorating process. Floats must be completely covered with natural materials, and each year she is amazed by the imagination people use to make elements look realistic. "I keep coming back because of the excitement, creativity and imagination that takes place here," Gwen says. "It's very satisfying, like the completion of a well-done painting." First-time decorators are quick to discover the passion that Gwen describes. 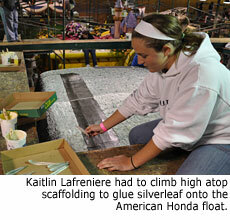 Kaitlin Lafreniere helped for the first time last year, and she was happy to come back for her second consecutive year. "It's a great feeling to be part of this amazing experience," says Kaitlin, who is a member of the marching band and Key Club at Granite Hills H.S. in El Cajon, California. "When I watch the parade on television, I can tell my friends, 'Hey, I helped make that!'" On this day Kaitlin was perched on scaffolding three stories high, carefully gluing silverleaf onto a float so large that you had to step back to recognize the form. It's the American Honda float, and it features a 49-foot tall animated robot. The trio of Vanessa Paneto, Austin Cole and Kristie Hermosillo, all members of the marching band at Don Lugo H.S. 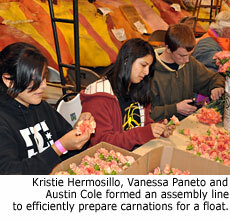 in Chino, California, are working a 7-hour decorating shift as one of their Key Club community service projects. "I try to plan events that are fun and also help people," explains Vanessa, who serves as the Key Club president and made the arrangements for the decorating shift. "Our goal is to do 10 hours of community service every semester." Austin is pleased with the variety of experiences the volunteer work has provided. "A lot of our projects are unique opportunities," Austin says. "We also did a project at a hockey game, and most of us would have never attended a hockey game if it hadn't been for Key Club." Residents of southern California have a great deal of excitement for the Rose Parade, even though it takes place in their backyard, according to Kristie. "We don't take the Rose Parade for granted. It's still special," Kristie says. "This year I'm decorating, but next year I want to march. I plan to audition for the Pasadena City College Tournament of Roses Honor Band." Another local resident, Maryann Griffin, says the Rose Parade is one of the highlights of her year. This is Maryann's 12th year serving as Volunteer Coordinator for Phoenix Decorating which is building 19 floats for this year's parade. "The Rose Parade is a great way to start the new year," Maryann says. 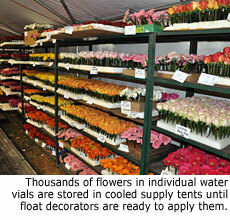 "For me, the Rose Parade is just like my birthday when I was age 10. It has the same excitement, the same anticipation. Last night I got only two hours of sleep."